COULD THE HAITI DISASTER HAVE BEEN FORECAST? So far as I know, none of the astrologers or prophets of note foresaw the Haiti quake. But could and should it have been foreseen at least by some? Here’s the conclusion, surprising even to myself and with at least some clues to the issue of fate and questions around the alleged curse of a satanic Haitian pact etc that have cropped up amid reports of this ghastly, tragic disaster. There are several “world points” in astrology, the most cited being 0 Aries. Another is 15 Leo. On January 12th violent Mars was bordering this point, and since there were other negative signs in the heavens at the time (like Saturn coming to station and dangerously squaring Pluto) it was a real possibility that there might soon be something particularly heavy for the world to hear about. The question was where and who might be affected? The little known horoscope of Haiti should have given at least some people more than usual cause for concern in relation to a long troubled nation. Haiti's nodal (fate) axis, and notably the traditionally “unfortunate” southern arm of this axis, conjuncts the mentioned world point that was being touched off. A leading expert on national charts, Nicholas Campion, believes the most definitive pattern for Haiti is for its independence from France, Jan 1st 1804, and, lacking a certified time he sets this for 12 pm (traditionally most nations used to be signed or declared into existence at that time). Campion is likely to be correct because the pattern appears to work. On the last day of ‘09 a lunar eclipse hit within one degree of the base angle of the chart, the factor involved with a nation’s land and a possible harbinger of any disturbances around it, and the same eclipse was directly opposite (i.e. challenging to) the national sun in the nation’s destiny/reputation sector. So Haiti might be in the news not long from that time; plus it seems to be the case that quakes are rather more likely to occur near to new and full moons which means near to eclipses when they occur. Haiti itself gained independence under the sign of Capricorn and has all of its Mars, Sun, Mercury and Venus in the sign along with the expressive Wounded Healer planetoid, Chiron. The latter point seems symbolically expressive of the national suffering. It also seems like one of the factors within the total pattern reflecting the national tilt towards poverty rather than wealth which under Capricorn can be a matter of extremes - like poor India(on the way to wealth) and fabulously wealthy Saudi Arabia. Haiti would be made and kept poor by the crippling burden of debt the departing French placed upon it - it was not paid off till 1947 by which time Haiti was far behind in the race to anywhere. 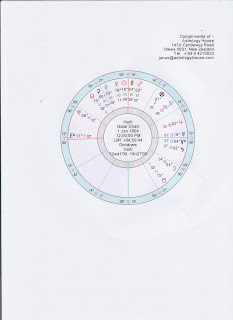 Significantly, again supporting Campion's chart, asteroid Poor aspects the national sun exactly from the eighth house always associated in political astrology with national debt. For Haiti, violent Mars is natally at 3 Capricorn with suffering Chiron conjuncting it at 4 degrees. That’s not a healthy combination at any time, but now on Jan 12th 2010 and following an eclipse with potential to start something we find (transiting) Saturn at 4 Libra coming to station at maximum strength and in affliction to this national Mars and Chiron combination. This pair was and is being presently conjuncted by the devastating death and transformation force represented by Pluto. That a quake might well be involved in the extreme tension gathered around the nation through the Saturn/Pluto aspect was arguably hinted at by the fact Neptune “the earth shaker” and often significantly placed in quake patterns and presently in shocking Aquarius, is closely square to Haiti’s natal Neptune. Something had to give….but how much? "All hell”? !…..The transiting Neptune is conjuncting Haiti’s national Hella asteroid (i.e. Hell because all early asteroids were registered in feminine form). The Hell asteroid, interestingly enough, is directly opposed to the national Part of Religion and Faith! In his usual unhelpfully sensationalizing way, tele-evangelist Pat Robertson has rushed in to remind media that Haiti is under a pact with the devil so that in effect the unfortunate people have more or less got what they deserved! The people are under some sort of curse. (But what about the children if so?). First let’s get the facts straight. While apparently some kind of rather dark pact is part of local history it was not necessarily overtly satanic - but then voodoo is never too overtly anything in belief terms - the Catholic saints cover for a whole mass of spirits and deities (loa). In 1791 in order to free Haitians from the French a group of revolutionaries met at Bois Caiman. A priestess was possessed there by the spirit, Ezli Dantor, who received the sacrifice of a black pig and this seems to be the ceremony subsequently regarded as the pact with Satan. Whatever it was the pact was felt to work except that everything went downhill to even worse poverty after the French departed leaving their financial exactions and threatening to return if they weren't met. Church groups in Haiti and Christians internationally went to lengths in 1997 to revoke the curse of the widely believed in rite and its assumed influence. Alarm was however expressed when in 2003 the controversial and corrupt president, Jean-Bertrand Aristide, declared Voodoo an official “religion” of the nation, a declaration which some felt partially restored the old pact and was problematic as it gave practioners the right to baptize infants. The religious scene is complex. About 85% is at least nominally Catholic many of whom practice Voodoo at least now and again (over 50% of the population is believed to practice it). The rest is either evangelical some evidently fervently so (there have been clips of people singing praises in the ruins after 3 days without food or water), or French style atheist like Reni Polvard who when he heard someone declare the "miracle" of a rescue shouted "There is no God, there's no miracle. How could he [God] do this to us?". It's nevertheless Voodoo which seems to overshadow the culture and outlook of the general population and it has been associated with the horrors of the murderous rule of President Papa Doc Duvalier who called himself Baron Samedi (a leading death associated deity of the cult) and the sadistic Tonton Macoutes who spread crime and violence everywhere. The heavens never lie though astrologers can miss their messages. I must be honest. The fact is that the alleged pact looks as though it might even be inscribed in the heavens at Haiti’s modern foundation. For years I have been insisting on an empirical basis and as written up in my Testament of the Magi (see last Blog) that the planetary symbol of God (biblically) and any issues around God is Pluto. Sure enough, at Haiti’s foundation Pluto is shown opposed to within minutes of a degree to asteroid, Lucifer, itself well within conjunction of the national moon (habitual and inherited ways of thinking). And, albeit loosely, the Part of Vocation and Status could be said to conjunct this moon and Lucifer. When quakes happen either nobody is blamed because it’s all a matter of what Mother Nature does (and obviously some quakes must happen in the order of things) or else God (Reni Polvard style) is blamed because he ought to care more and stop it. The truth could be more subtle and otherwise. As I wrote in Chapter 3 of my Cosmic Father (available on Amazon) believers and unbelievers alike today almost stubbornly refuse to accept, or ignore or don’t realize that the New Testament is rather explicit that the devil is god and ruler of this world (the devil even offers the world to Jesus at the Temptation). Esoteric groups privately teach this. The theosophist, Madame Blavatsky, taught Lucifer rules the world. The mission of Christ is/was opposition to this fact, a reclamation of the world. I can’t hope to work out all possible implications of this kind of doctrine but it will tend to mean that bad things must often happen in this world and at most we can ask for and receive some degree of protection against them. If individuals or nations positively invoke the forces of evil divine protection can’t and won’t apply. The universe is set up by God on a democratic basis and we must accept the consequences of our decisions which may even be the most awful consequences. I’m not saying that a quake in Haiti wouldn’t have happened. But I must allow the possibility that it could have been a less extreme event (and not only if housing standards had been more applied!) if the people were rather more God than spirit aware and devoted. One of the reasons I allow myself this tricky critical thought is because despite all the suggestive stellar negatives I have pointed to I still wouldn’t automatically have expected a quake and I wouldn’t blame astrologers for not seeing it. (I think we all suspect more trouble this year and next under the afflictions of Uranus to Pluto, again some of it on a world point). Admittedly I make no claim to be any expert in reading quake charts, but when I set up what is called an Event chart for the time of the quake I was a bit surprised. For one thing the classic indications like so called angularity of planets was not present. And I think Saturn against Pluto is not the most typical or automatic indicator just by itself. In fact, as I recall from past reading, the usually fortunate Jupiter and the shocking Uranus are said to be much involved in the patterns. So I feel that the quake needn’t have been as bad as it was. BUT, the highly stressful Saturn/Pluto interplay does have resonances of a God (Pluto) versus devil (Saturn, traditional devil symbol in astrology) conflict. I maintain Saturn/Pluto was even involved in the crucifixion and certainly Saturn “rules” Capricorn, Haiti’s birth sign. And in passing let's note that Baron Samedi a presiding spirit of Voodoo, the Spirit of Death and identified with by Papa Dox, means Baron Saturday and Saturday is always traditionally Saturn's day. For such an obviously spiritually engaged nation, (if negatively so), the national pattern does look rather spiritually engaged. I have therefore to admit the possibility that something demonic is a factor (one factor, I didn’t say all) in the disaster that has occurred. Even transiting Neptune conjuncting Haiti’s Hell asteroid is like if not a symbol of hell’s payback then a symbol of hell’s irruption onto the scene. So it’s possible that without a hidden divine intervention the disaster could have been even worse than it was, a sheer wipe-out. Whatever the precise truth, and I can't hope to know it, I do believe it would repay us all if astrology received more respect and was studied to see what warnings it could give. It can rarely tell us a quake will happen but it can be used to pinpoint times of heightened tension and danger. Meanwhile we must hope that rescue missions to Haiti will succeed. That there would be much goodwill and as much assistance as possible is reflected in the close aspect of Jupiter to the national Venus at the time of the quakes, a positive aspect amid the gloom. This is certainly an interesting accumulation of astrological pointers. It's always a lot easier to see in hindsight. It's true nations do make pacts with Satanic entities and renew them through periodic rituals. The spiritual 'cleansing' undertaken in the 90's was effective on various demonstrable levels. But when a nation's leader makes the kind of proclamation subsequently made it can bring the nation back under the earlier pact or covenant; it reestablishes the authority or right of the spirit entity. There is constant war between the two kingdoms of God and Satan, Light and Darkness.